Cozmic One on the tack at Mayberry Farm in March. Photo by Kyle Acebo. Does Coz have Zenyatta’s personality? A: Yes, he’s similar to his mother. He’s so confident, and he’s confident like she is. Being a baby, that’s kind of rare. He’s very confident in himself and that’s encouraging. At what point in a young horse’s training is he or she galloped fast enough to determine whether that horse looks promising? A: We don’t really ask for speed here. It’s more about their way of going. You get an idea, maybe three months from the start—this one has ability, this one not so much—but we don’t flat out go here. That’s for the trainer. We teach them how to run. A farm environment is so different from the race track. There will be horses for whom the lightbulb just doesn’t go on yet. It has to do with their age too. They can take longer to mature—as they get to the racetrack that bulb is getting brighter. If it’s a mature horse and you get the idea that they know what they’re doing, you may be able to tell if they have promise, but there are a bunch of question marks in between. Think of them as kids; we’re the elementary school. 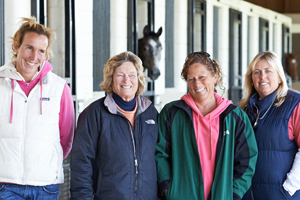 What does Mayberry Farm’s do differently than other farms that break yearlings? A: I think we have more of a hands on approach than other people in our position. My mom, my sister, my cousin, myself, we’re all hands on (note: April answered this question). There’s no training from the car or calling assistants or taking weekends off. It’s all day and all night. When there’s a sick horse, we get up at midnight and come out. We get to know our horses, we spend so much time with them. We’ve also been on the racetrack, and we know where the horses are going. We came from there. Most people start at the farm and go to the race track; we did the opposite. We know what trainers want and what they’re looking for, so it gives us a little bit of an advantage in that regard. There is an undercurrent that feeds us false impressions like a gentle trap that tells us we are doing right-because it feels right. Feelings are so easily manipulated they can’t be trusted as a measure in anything. We stay with bad habits because it feel right. The habit comforts our feelings and the familiar touch makes us believe we can’t give it up. But it is the path that winds back through the same experiences-almost like being lost in a jungle. We think we are on the right road out, until we find our own footprints going around and around. Whether it s a habit or a person, or a situation we are trying to escape, we have to know our feelings are not to be trusted. They keep us knocking on a door that seems like home but is simply the same stopping-off, na hna i, familiar place. Beware of feelings that deceive. Dear Kathy.Anxiously awaiting the arrival of the 2nd chick is taking it’s time!Poor Fubu isn’t at all well even refusing the dropper,am so worried for him!Am so glad he lived to see his birthday.We’ll have to see what happens today.I have been looking at Babinka’s funeral,her mummy was so courageous at the end and Bakinka looked very peaceful.May God bless them all.Marty enjoyed his visitors and can do bizness in Utah now,his map is filling up.Dolly’s mummy is going out today for the 1st time in 3 months maybe a bit dangerous! !Zoe and her mum looked so cute reading Norbert’s book together.Am off to visit the rest now!Have a great day.Hugs to you,Kisses for Holly,Nikko and Sugar.Sheena. Sheena, prayers for poor Fubu!! Fingers crossed that the 2nd chick hatches today. I’m afraid for Fubu. It surely isn’t a good sign when an animal doesn’t eat. His poor mom is just grasping at straws, it seems. So hard to know when to let them go. I don’t think I’ve ever seen an animal more loved or respected as was little Babinka. Her mom is indeed courageous. I’m so glad she still has Tiny Tina and Pepito to comfort her. Marty is so cute. The cousins went to see “that other mouse” but they like Marty the best. lol Utah bizness license…maybe he can do something with the Mormon Tabernacle! Stay safe, Dolly’s mama! I think they need to make Zoe’s pics reading the book into bookmarks for the library. Wouldn’t they be great? Have a wonderful day. Hugs from me, kisses from Holly, Nikko and Sugar. Kathy. Babinka’s brother’s name is actually Peppino…I just checked. Steve Haskin is one of the best writers today on racing and horses. His description of California Chrome after the race can bring you to tears. Worth reading and also the Comments at the end of the article. Yes, it’s a great article. I’m so glad that I didn’t actually SEE the vision of Chromie walking through the tunnel that he described. This is a much more reasoned approach to the whole thing than the rant by EH on Blood-Horse. Wow I think people are so ingrate, they forgot that CC got hurt, and I know he lost for the pain that he had in his hell. I wish I can see Haskin running in a marathon with injure hell, I pretty sure he will never run! Dear Blue thanks for the link. As the world awaits the result of the Belmont Stakes on June 7, Maryland Jockey Club president Tom Chuckas is campaigning for a change to the schedule of the Triple Crown races. Although his initial suggestion was made public before California Chrome won the Preakness Stakes, Chuckas continued with his proposal even after a Triple Crown went on the line. Chuckas’ plan to move the Preakness to the first Saturday in June and the Belmont to the first Saturday in July has been met with an overwhelming cry of outrage from racing’s traditionalists, but the move would not be the first time the schedule has been altered. This was written before the Belmont Stakes! Bluegrass girl, Hasken sure wrote an excellent article and you are right, his description of Chrome after the race brought some tears!! I have always liked his articles. Chrome is an amazing horse to have endured his injury and have such heart to give his all up to the end of the race. Wow, I love this horse. oops, perhaps I should have said “to give his all past the finish line of the race”. Hi Zsters; This past Fri. I rode out with two others about an hour away to a beautiful equestrian center and visited Sir. As we approached I could tell who he was even with a fly mask on! He was with six other geldings all in the paddock at the time. Sir has lost weight, but I saw a bit more muscling, probably from the extra running he has done of late. Sir can not lose anymore weight though. He had a couple nicks on his neck. I am sure he is learning who are the alpha’s. We had to coax this grey away, taking turns, so that we could spent some time with Sir and give him his carrots he loves. I think he found a horse friend there! He is black and Sir and he stood together resting. At one point the black put his head near Sir. I do not know where Lilly the mare was. She had to be placed further away I imagine. I got back home thinking this will be a good home for Sir being with the herd and I got an email from the gal I rode up with stating she was told by Becky (who took Sir in), she does not want him, he is stupid and we better find another home for Sir. How can a person who apparently loves horses, who formerly owned him, say she will take him back, our head, Cedar Community pays expense to trailer and Coggins testing, and two weeks later she does not want him!! “Find another home for Sir ASAP” is what she has expressed just yesterday too. Sir of yesterday-the Sir she remembered, the younger Sir. She was not prepared for the Sir of today-older, battle worn. Having been with Sir, do you have a suggestion on where to send him? This has been a tough journey for Sir and even tougher for you. Belmont runner up Commissioner found to have small chip in his front left ankle Monday, scheduled this week for surgery. I did not see the image of CC after the race. I am glad I didn’t. Steve Haskin is the best writer when it comes to capturing a moment be it joyful or haunting. Before the Belmont I read Bill Nacks poignant story of the day Secretariat had to be put down. I will never get his words out of my mind. Finding out by accident how sick Secretariat had become and knowing the end was near. The image of Mr. Nack sobbing at the passing of greatness. We are blessed to be able to share the beauty, spirit, speed and courage of these wonderful animals. CC will race another day and I will never forget the thrills he gave me this spring. Sir will find the kind of forever home he deserves. Shame on his former owner. Just caught up on previous posts and didn’t know about Beholders injury or any of the others. Sounds more like roller derby or Nascar than horse racing. If it’s not rubbin its not racing? I told my brother Jesse he really should take up racing but he said he didn’t think his health could handle the strain what with all my hand wringing, go Chromie going, leaping up and down and collapsing from the excitement. He said if thats what I do when my horse loses what would have happened if he’d won. All of the above plus I would have cried buckets of joyful tears. Will Mario be his trainer? I hope so too! If Keeneland gets the Breeders Cup next year, I am 100000% in and Spendthrift would definitely be on my list to go to! That is hope that will get to see Goldencents in person.